Certified translation services assure the client high quality and accuracy of the translation. 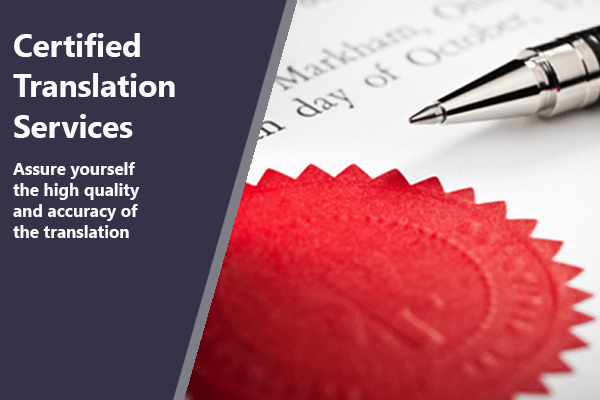 It is mandatory to keep the exact meaning of the source language in legal and official document translations such as birth/marriage certificates, contracts, property transaction documents, immigration paper nd government treaties. An amateur or freelance translator can do the translation to an extent, but you cannot expect an error-free job from them always. A certified translator’s service will help you in this regard to avoid any problem due to the inaccuracy in the translation. We can rely on a certified translator if we need to translate technical text such as technical manuals, product brochures etc. In this era of globalisation, most of the major languages of the world are facing a rapid increase in the need for translation services, both for commercial and official purposes. Businesses who want to reach foreign markets use the expertise of certified translators to address and attract customers of distant countries. Official and legal documents also need to be translated, without losing out on accuracy.Marketing in a foreign country needs a complex localisation treatment of language. Mere translation will not do here. Localisation in product brochures and advertisements can be done effectively by a Shan-Singapore professional and certified translator only.Today many companies attract foreign customers through online strategies and they need multilingual translators for this task. Website translation is entirely a different area. A Certified translator’s service is essential for online marketing translation services, SEO and PPC translation.